A Windows system with at least 1 GByte of RAM. 2 MB of disk space for installation. Please see Installation Manual which can be found in the application directory for configuration details and operation. Please make sure that there is not any other SMTP / POP3 server running on the same machine. To install TekSMTP, extract contents of TekSMTP.zip to a temporary directory, run Setup.exe from the distribution. Uninstall previous version if you upgrade from an earlier version. Run TekSMTP by double clicking TekSMTP Manager icon on the Windows desktop. Define e-mail domains and mailboxes in Mailboxes tab. You can set SMTP / POP3 listen ports at Protocols tab. You can set multiple ports for SMTP service. You can optionally enable / disable SMTP authentication which is enabled by default. 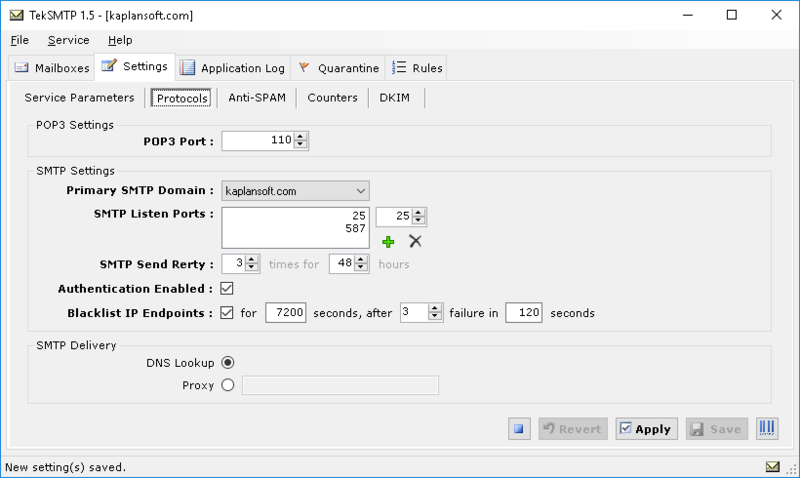 If enabled, TekSMTP monitors failed SMTP/POP3 connection attempts from suspicious endpoints and blacklists them. 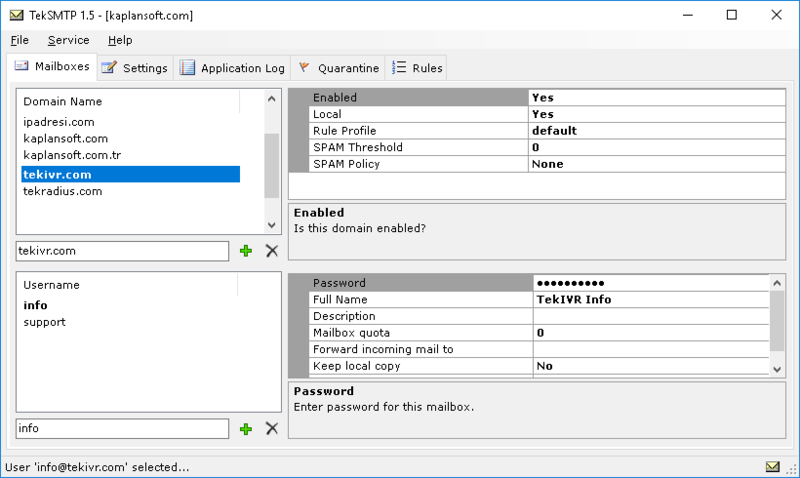 You can also set delivery method for outgoing mails; etiher to a SMTP porxy or DNS resolved mail server. 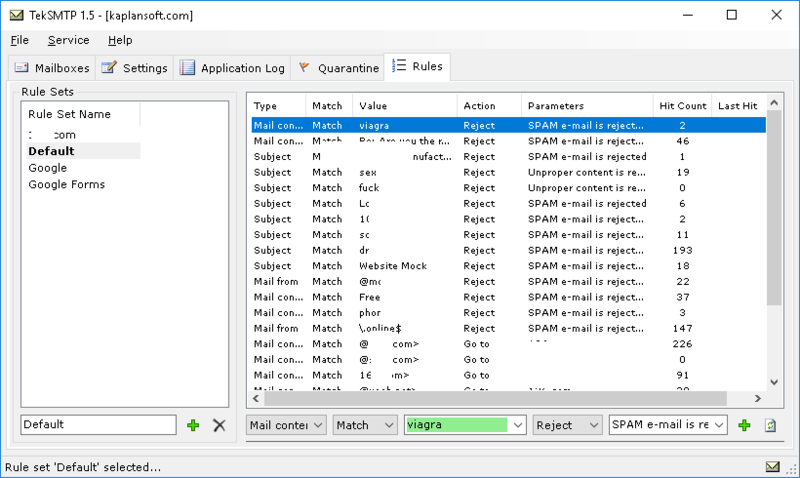 TekSMTP can query RBL databases to filter SPAM messages. You can specify your own DNS black lists. Some RBL systems require connecting them directly. You can also check validity of sender domain. You can process incoming e-mails by using a rule set. Each rule set has its own rules processed by order as specified in Rules tab. Host IP address. Send IP address (IPv4 only). HELO/EHLO FQDN. FQDN received in HELO / EHLO request. Mail from. Sender e-mail address (Received in SMTP negotiation). Mail to. Recipient e-mail address (Received in SMTP negotiation). Content. E-mail content including headers. Date. Date of e-mail received. Time. Time of day of e-mail received. You need to specify match time for the rule. It can be either "Match" or "No Match". TekSMTP expects parameter in in regular expression format so take care of regular expression special characters to be escaped. 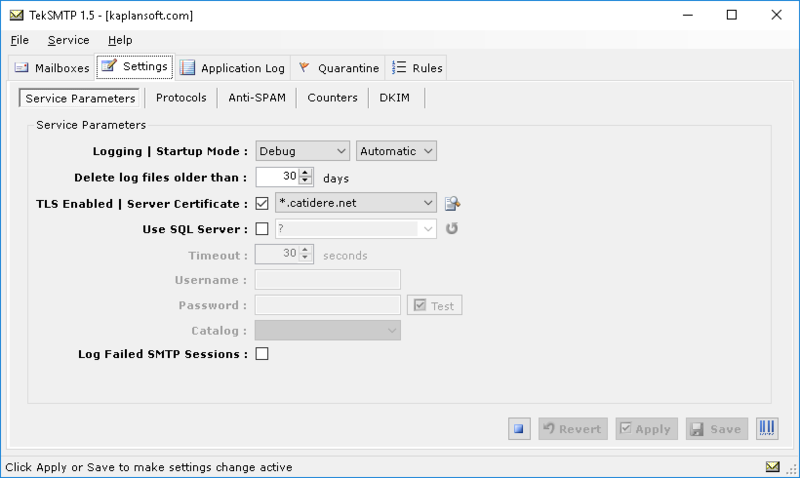 TekSMTP Manager GUI gives a hint by chancing background color of parameter entry. Green means correct entry. Pass. TekSMTP accepts the e-mail and process no preceding rule. Reject. TekSMTP rejects the e-mail and process no preceding rule. Forward. TekSMTP accepts and forwards to the e-mail specified in action parameter and process no preceding rule. Copy. TekSMTP accepts and forwards a copy of the e-mail to specified in action parameter and process no preceding rule. %ipaddr% Send IP address (IPv4 only). %helohost% FQDN received in HELO / EHLO request. %mailfrom% Sender e-mail address (Received in SMTP negotiation). %mailto% Recipient e-mail address (Received in SMTP negotiation). Go to. TekSMTP executes specified rule set in action parameter. You cannot specify rule set itself. TekSMTP will break execution of rule set if rule set has been executed already. E-mail will be accepted in such a case. Freeware edition allows one rule set and maximum 5 rules. You must have a "Default" rule set. TekSMTP will start processing rules in Default rule set first.